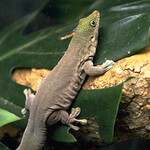 The Standing's day gecko's body is similar to a flattened cylinder, with shortened limbs. It's head is much larger than its body. Hatchlings have a yellow-green head with a series of lines and bars. Adults are light gray with some light turquoise color on the head and tail and tiny gray reticulated markings on the head and body. Females and males similar in size and appearance and average 8.25–10 inches in length. Males are distinguished from females by their large, well-developed brown femoral (thigh) pores. The southwest of Madagascar is home to this species. Until the early 1990s, the range of this species was one of the very few areas in Madagascar which was relatively undisturbed. 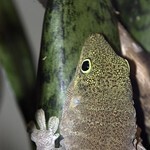 However, because of increased deforestation, Standing's day geckos are now of special concern and considered vulnerable. 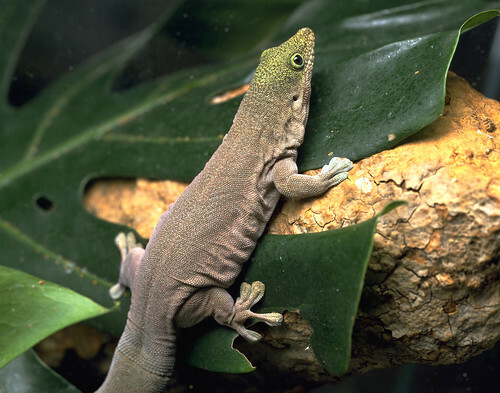 Lincoln Park Zoo cooperatively manages Standing's day gecko populations with other institutions in the Association of Zoos and Aquariums. Standing's day geckos reside on trees and other vegetation in dry thorn forests. 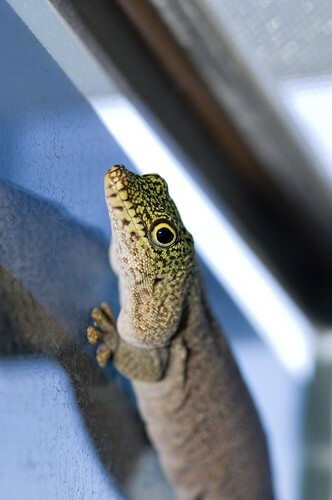 Unlike other types of geckos, these are very territorial. 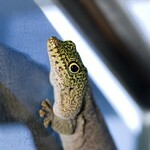 Standing's day geckos eat insects, invertebrates, nectar and pollen. This species always occurs in true pairs. They live in partnerships in which, should one of the animals die, the remaining partner will not normally mate with another. Eggs are typically laid in joints of leaves or under surface ground litter. Usually two eggs are laid and hatch in approximately 70 days. 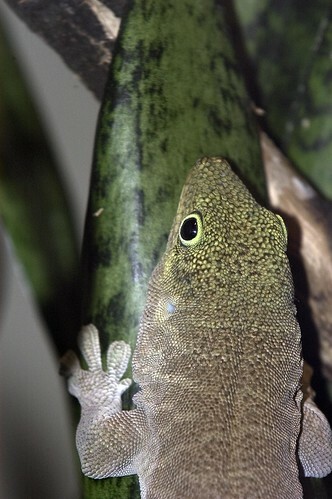 Flattened toe pads are covered on the bottom with scales called lamellae, which enable geckos to climb up steep, slick surfaces like glass walls or ceilings. Their small size and short limbs help geckos hide in rock crevices and under dry scrub.